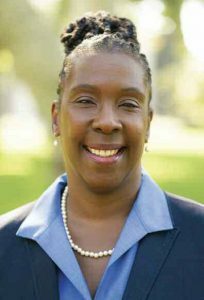 Pomona College’s new vice president for student affairs and dean of students, Avis E. Hinkson, brings more than three decades of higher education experience in areas ranging from residential life to student recruitment to undergraduate advising. Her new role, which she began on Aug. 1, marks her return to Pomona College, where she was an associate dean of admissions from 1990 to 1994. As dean of the college at Barnard College in New York, Hinkson led a staff of more than 100, overseeing academic advising, career development, registrar, health and wellness services, counseling services, Title IX services, residential and campus life, international and intercultural programs and diversity initiatives. At Barnard, she worked with colleagues to shape the student experience and campus culture while sustaining direct involvement with many of Barnard’s 2,500 undergraduate women and serving as a key partner in Barnard’s unique connection with Columbia University. Hinkson’s other roles have included dean of admission and enrollment planning at Mills College in Oakland, Calif.; associate director of admission and director of minority recruitment at the University of Southern California; and associate director of admission and minority recruitment director at Cornell University. Among her current professional activities, Hinkson serves on the board of the Consortium on Financing Higher Education as chair of the assembly for the organization of 35 highly selective private colleges and universities committed to meeting the full demonstrated financial need of admitted students. In addition to earning a doctor of education degree from the University of Pennsylvania, Hinkson holds a master’s degree in student personnel administration from Columbia University’s Teachers College and a bachelor’s degree in psychology from Barnard. She succeeds Miriam Feldblum, who departed in February after a decade of service to become executive director of the Presidents’ Alliance on Higher Education and Immigration, a new initiative that advocates for the legislative interests of immigrant, undocumented and international students on college campuses.